Natural Born Learners : Ask me about Open Source Learning, Unschooling, Self-directed Learning and Autonomy in Education. Interested in Open Source Learning and Unschooling? Heard about autonomous, self-directed learning and wonder if you too can do it? Drop me a line and I'll get back to you. 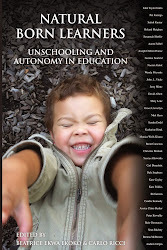 Are you new to unschooling? Are you stuck in unschooling and looking for ways to regenerate your practice? I can help. First 1/2 hour session is free. Following consultation fee is $50 an hour.